Arytenoid chondritis is a progressive inflammatory condition of the horse's arytenoid cartilages. The arytenoid cartilages are paired flaps of cartilage that lie at the opening to the trachea or windpipe. During inspiration, these flaps are pulled apart to allow as much air as possible to pass through the trachea and into the lungs. They then return to a semi-open position during expiration. There are three clinical presentations of arytenoid chondritis in horses, including: simple mucosal ulceration, granulomas, and cartilage deformity. It is the size of the granulomas or enlargement of the body of the arytenoid which determines the presence and severity of the obstruction of the airway. Chondritic arytenoid cartilages are significantly larger and abnormal in shape compared to arytenoid cartilage in normal horses. Arytenoid chondritis most commonly presents in horses as reduced athletic performance and respiratory stridor, as a result of upper airway dysfunction. 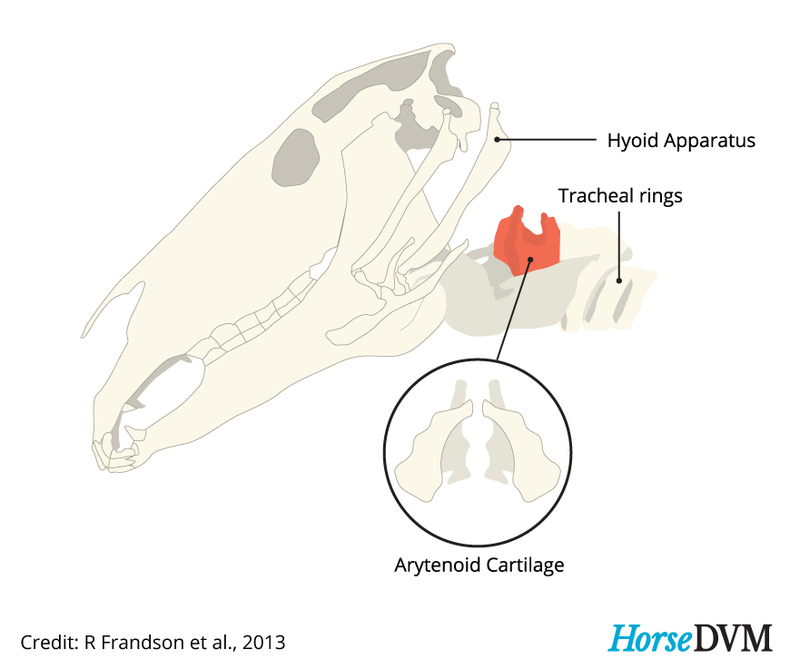 Horses with arytenoid chondritis can have similar symptoms and histories as horses with laryngeal hemiplegia (roarers). The most common treatment for arytenoid chondritis involves surgery. Medical therapy is also sometimes performed, which includes administering broad-spectrum antibiotics and placement of a tracheostomy tube. Surgery Surgical removal of affected cartilages from the larynx or tracheostomy. There are complications associated with surgical treatment of arytenoid chondritis. Some horses will develop an intermittent to persistent cough when eating. Medical therapy Broad-spectrum antibiotics and placement of a tracheostomy tube. Treatment is rarely curative. Most frequently diagnosed in young racehorses between 2 and 4 years of age. It can also occur in middle aged to older horses, but often goes unnoticed until it is quite advanced unless the horse performs an athletic function.